A’s fans have a lot of opportunities to learn about loss. Not just the kind that inevitably greets their team in playoff elimination games, but the kind that often comes when one of their productive players nears 30 or approaches free agency and receives a text from his agent telling him he’s headed out of town. The latest star to get the Oakland Logan’s Run treatment is Josh Donaldson, a piece of found art that appreciated by the bay and brought back Brett Lawrie and three prospects from the Blue Jays on Black Friday, leaving many wondering, as always, what Oakland’s angle is. Donaldson has a more interesting origin story than most stars: Drafted by the Cubs as a catcher with the 48th overall pick in 2007, he was acquired by the A’s (who, according to a 2013 oral history from Fox Sports, had hoped to draft him) in an earlier Billy Beane roster retrenchment, the 2008 Rich Harden trade. A strong-armed backstop with a passed-ball problem, Donaldson saw an opportunity in the organization’s thin third-base depth chart and began to play the position part time, taking to it quickly thanks to his experience as an infielder in high school and college. Although he played third increasingly often in the minors during the 2011 season and in the Dominican Winter League, Donaldson reported to spring training with the pitchers and catchers in 2012, hoping to land a job as Kurt Suzuki’s backup. However, a Scott Sizemore injury created a vacancy at third, and Donaldson helped filled it, though not without a few false starts. By mid-August, after two trips back and forth from the Pacific Coast League, Donaldson’s stats in Triple-A and the majors told conflicting stories: In 100 major league plate appearances over 28 games, he’d hit .153/.160/.235 while whiffing 26 times against only one walk, but in 234 minor league plate appearances over 51 games, he’d hit .335/.402/.598 while earning 23 free passes to 34 K’s. The A’s bet on the bigger sample and promoted him for the stretch run, and Donaldson rewarded them with a .290/.356/.489 performance over almost 200 big league plate appearances through the end of the year. That was the start of a two-season-plus stretch in which Donaldson was the best player on one of baseball’s best teams. By Baseball-Reference WAR, only Mike Trout and Clayton Kershaw matched or exceeded Donaldson’s value from 2013–14; by FanGraphs’ figuring, he outproduced everyone but Trout and Andrew McCutchen. Both Donaldson’s 2013 and 2014 seasons were more valuable than any Oakland position player’s since Jason Giambi in 2001. Donaldson offered above-average offense, durability, and defense, ranking ninth and 10th in the majors in DRS and UZR, respectively, over the same two-season span,1 and he won the Fielding Bible Award in 2014 after finishing fourth among third basemen in 2013. As I’ve described him so far, Donaldson sounds like the type of player whom teams typically build around rather than trade four years before free agency. The A’s, however, don’t operate like most teams, and Donaldson isn’t like most players with between two and three years of service time. As I noted after tracing every MLB roster spot back to its source, Oakland’s current roster rests, more than most teams’, on a foundation fertilized by long-since-traded stars.2 Twenty-two of the 40 players on Oakland’s expanded roster were acquired via trade, tying the Rays for the most in the majors.3 Beane has repeatedly converted his prospects into present-day players rather than hoard them for the future. Look back through Beane’s long history of dealing stars — Tim Hudson, Mark Mulder, Dan Haren, Harden, Matt Holliday, Yoenis Cespedes — and you won’t find many who had four years of team control remaining at the time of the trade. There is some precedent — the A’s extended Nick Swisher before dealing him, and Gio Gonzalez, another Super Two, had four years left when he went to Washington — but Donaldson’s combination of service time and skill makes this look like Beane’s most aggressive sale. Thus far, Donaldson has offered the most surplus value imaginable, putting up superstar stats while making the league minimum. From this point forward, though, he’ll make much more and probably produce less (although the change in ballparks will camouflage his decline). The A’s bought low on Donaldson after an anomalous half-season helped convince the Cubs to let him go, and last week, they sold him high. Converting a minor league catcher into the game’s best third baseman and then flipping him for youth isn’t a repeatable blueprint in the way that turning Billy Koch and Andrew Bailey into closers and auctioning off their saves was, but it made a deal that the A’s were “absolutely roasted” for at the time more than worth the critical columns. Like the Harden deal, this is a trade whose winner might not become clear for several years. The Toronto side is simple: In case it wasn’t obvious from the Russell Martin signing, the Blue Jays consider themselves contenders, and by adding Donaldson, they’ve made it easier to envision an end to the offseason that makes them look like serious threats. They still have holes — GM Alex Anthopoulos admits he’s looking for help in the bullpen, in left field, and at second base, and the lineup remains heavily tilted toward the right — but their new additions, combined with Jose Bautista (who inspired Donaldson’s revamped swing), Edwin Encarnacion, and Jose Reyes, give them most of a playoff-caliber lineup. And while the rotation still seems thin, adding Martin and Donaldson on defense should improve their pitching staff as much as two position players can. In Lawrie, the A’s got one of the few human beings as intense as Donaldson, and a replacement at the same position who’s entering his prime as Donaldson exits his. Lawrie hasn’t come close to repeating the offensive rates he posted as a rookie, in part because of the injuries that have cost him 177 games over the past three seasons. He’s a fine fielder, though, and at 24 (until January), he’s young enough for teams to believe that his bat could bounce back. While Lawrie is also entering his arb years and will reach free agency before Donaldson, his lack of playing time and empty awards case should keep his cost comparatively low. 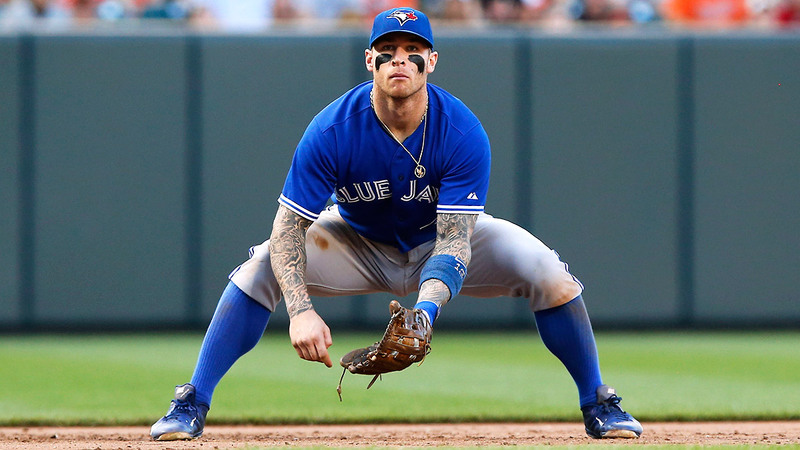 Lawrie also offers the positional flexibility that the A’s prize, having played second for a chunk of last season after the Jays gave up on Ryan Goins and Chris Getz. If the A’s can keep Lawrie healthy, the gap between him and Donaldson, who had his own injury issues at the end of the year, won’t be as large as their recent track records suggest. In that glass-half-full scenario, a significant contribution from the prospect part of the package could close the gap completely. Sean Nolin and Kendall Graveman, the two arms in the deal, are back-of-the-rotation types on the front half of their twenties who’ve already debuted in the big leagues and could help the A’s as soon as next season. Nolin is a fly-baller with fringy stuff who should be thrilled to pitch in the Coliseum instead of the Rogers Centre, while Graveman is a sinker/cutter ground-baller who might be bound for the bullpen. Franklin Barreto, an 18-year-old Venezuelan shortstop, is the real prize on the prospect side, though he’s also still a stranger to full-season leagues. Barreto isn’t big and can’t compare to Addison Russell, whom the A’s sent to Chicago in the Jeff Samardzija deal, but he’s fast, makes forceful contact, and has a chance to stick at short, where the A’s are also grooming 2012 first-rounder Daniel Robertson. All told, it’s not an overwhelming return for an elite, affordable talent, and it would have been easier to like Oakland’s side had the package included a prospect who combined Barreto’s ceiling with the young starters’ major league proximity. However, there’s enough there to envision an outcome where the A’s aren’t unhappy, and their history of getting good value in trades where they give up the best present player has to count for something. Like the Red Sox’s recent signings, this trade is likely a precursor to subsequent transactions on both sides, which makes it tough to analyze in isolation. Coming so soon after the A’s traded for Jeff Samardzija and Jon Lester, appeared in the postseason, and signed Billy Butler, their decision to deal Donaldson looks like a philosophical flip-flop. But the A’s are a post-success-cycle team, and their answer to the “rebuilding or contending?” question is always “both.” Beane never seems married to a particular timeline or approach to team-building, which might be the secret to avoiding long losing streaks with low payrolls. Oakland’s players are convinced that the A’s are rebuilding, but neither they nor we can see the complete plan. The 2014 A’s had no rookie pitchers, and they got only seven plate appearances from rookie batters (Billy Burns and Bryan Anderson). According to the Elias Sports Bureau, only one other team in the Divisional Era has featured fewer than 10 combined plate appearances/batters faced from rookies.4 Every team needs young talent, if only to trade it away, and Oakland’s success has made it difficult for the organization to add it via the draft. The A’s always plan with pessimistic scenarios in mind, and Beane feared the potential deterioration of an aging roster coupled with a depleted farm. To avoid that fate, he employed a proven solution: Refresh the tree of contention with the blood of an established star. Albeit behind fellow third basemen Manny Machado, Nolan Arenado, and, in the case of UZR, Chase Headley. Which Jeremy F. Koo of Athletics Nation found out firsthand when he diagrammed the team’s torturous transaction lineage last week. The MLB average is 12. The 1971 Orioles, with five, all from batters.